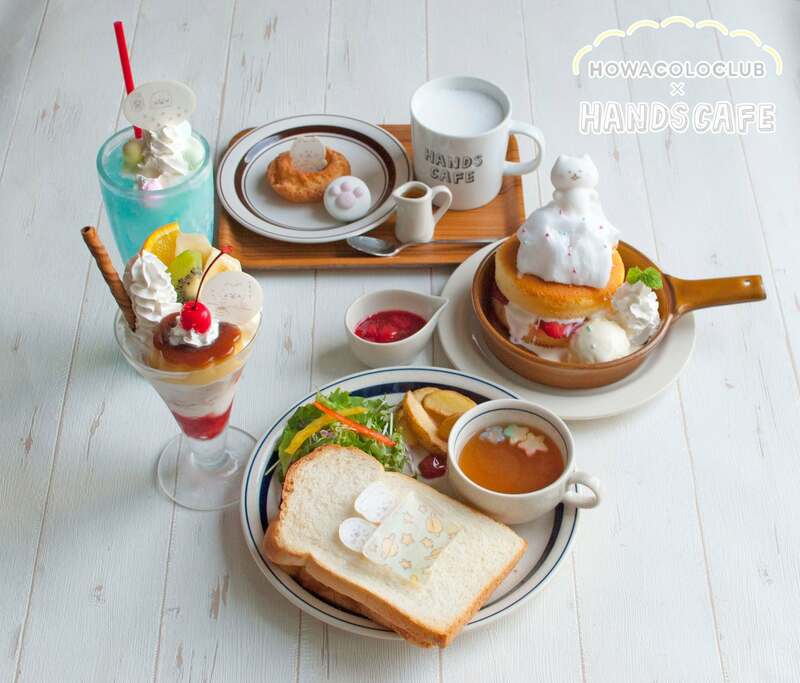 The hugely popular characters of Howacolo Club―a Japanese web comic―have teamed up with five Hands Cafe branches around Japan. The branches in Tokyu Plaza Omotesando Harajuku (Tokyo), Etomo Chuorinkan (Kanagawa), Umeda (Osaka) and Piole Akashi (Hyogo) open on August 22 and the one in Shinjuku (Tokyo) opens on August 23. The collaboration will run until September 17. There will be 5 different foods and drinks themed on the characters in Howacolo Club including the popular puppy Howacolo-chan. The cafe interior, too, will be transformed into the world of Howacolo Club with illustrations, plushies and more. Howacolo-chan and Muku-chan are sleeping soundly atop delicious pizza toast. There are two different futon designs: doughnut and space. Look forward to seeing which you get! *Not sold at the Shibuya branch. Howacolo-chan loves to play pranks and is poking the purin. 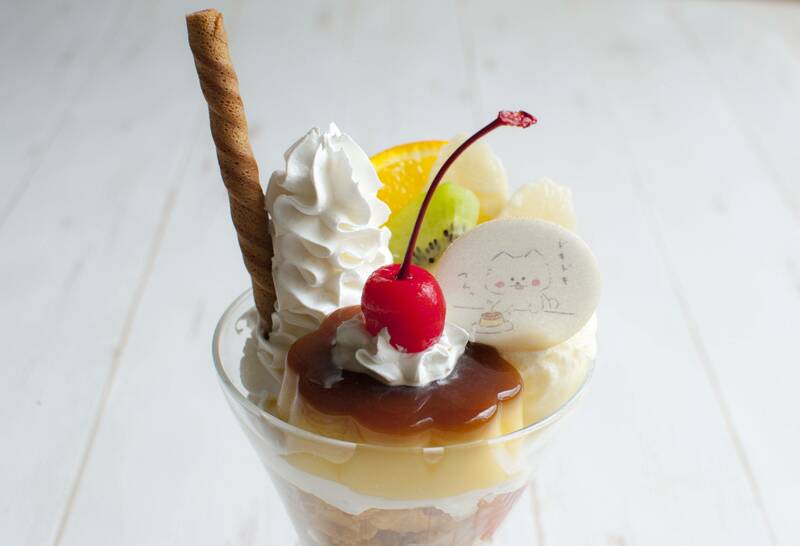 That super popular scene and decisive moment from the manga is featured on this parfait. 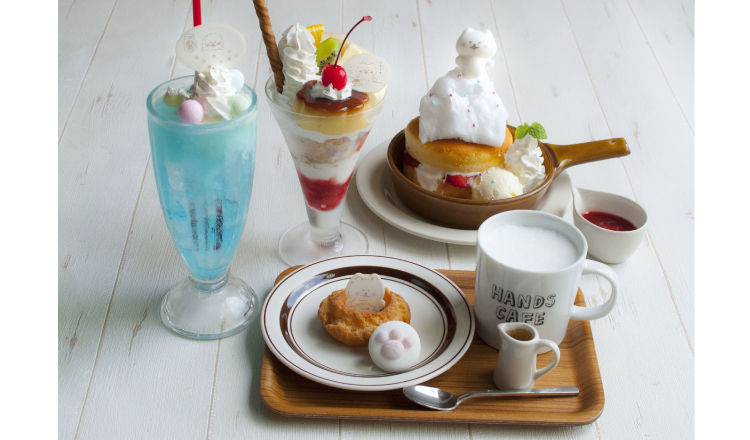 Howacolo-chan isn’t the only one who’s going to want to poke the wobbly purin when this dessert is ordered. Howacolo-chan loves howatto cakes (pancakes). This summery pancake is served with refreshing strawberry sauce and vanilla ice. 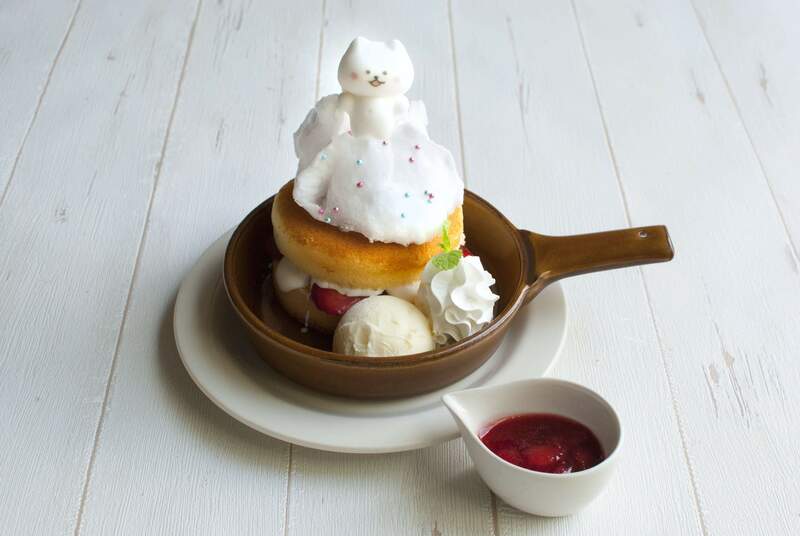 The cute Howacolo-chan marshmallow on top features an original design made for this cafe collaboration. 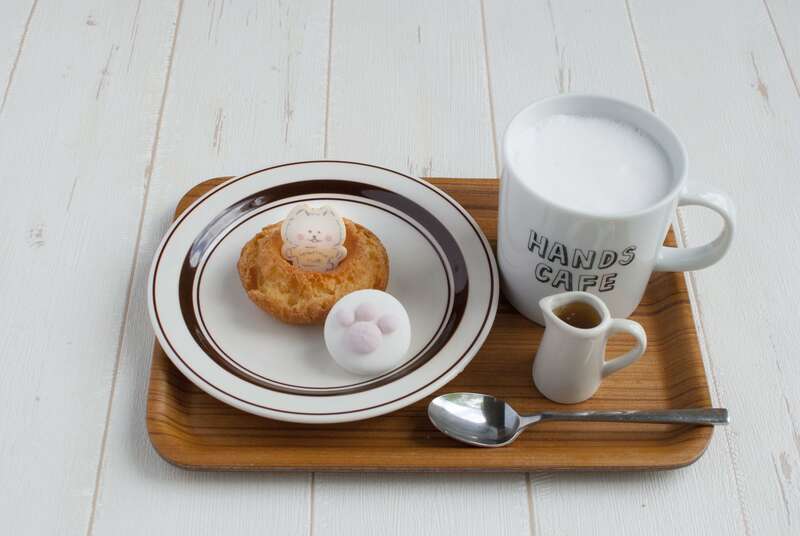 Howacolo-chan’s favourite combination of doughnuts and hot milk is served with an original paw design marshmallow. You’re sure to be warmed up ordering this. 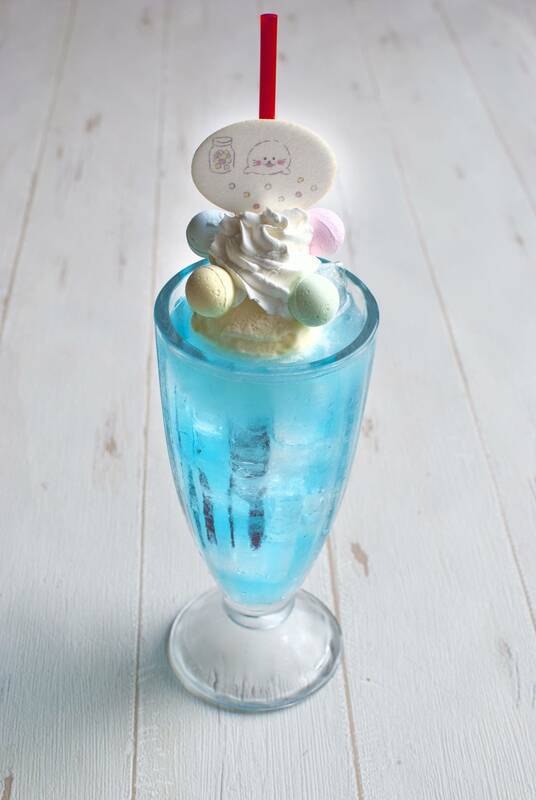 This summery float drink is inspired by Muku-chan the earless seal’s home – the ocean. The bright blue coloured soda sure looks refreshing. It’s also served with a wafer cake featuring an illustration of Muku-chan and a ramune ball inspired by Muku-chan’s favourite marbles. *All prices listed do not include tax. Enjoy a relaxing cafe time with the Howacolo Club gang.